Thank you to ButcherBox for providing this box as a sample for my review and having me as an affiliate! All opinions are my own. When I first started seeing ButcherBox, I wondered is if it was really worth all of the hype? I was seeing it everywhere and I was intrigued. As someone who’s constantly at the grocery store and is always looking for deals and quality, I really thought it was worth a try. But there are always a lot of questions when investing in something new. What is it really? What is the quality like? Is it flexible? It right for me and my family? So today, I’m excited to be teaming up with ButcherBox to share my honest review and personal experiences! What is ButcherBox? How does it work? 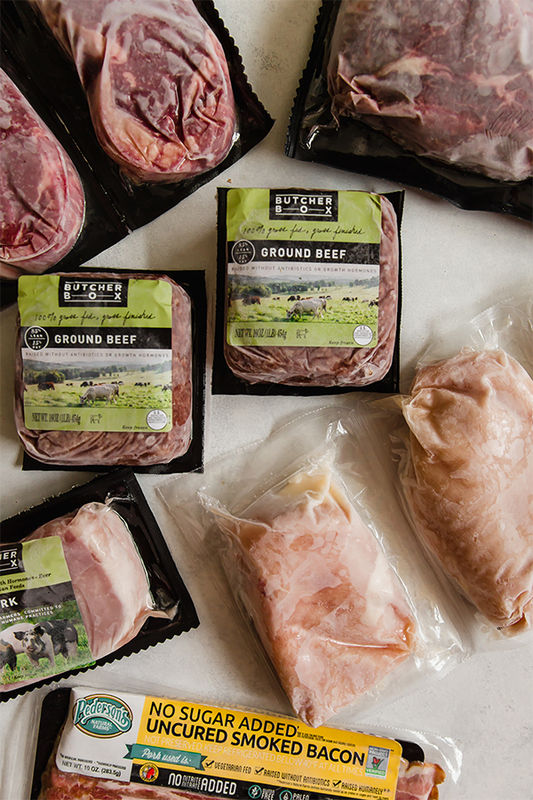 ButcherBox is a meat delivery box that delivers grass-fed, pastured and organic meat to your door. It takes the stress out of shopping and finding high-quality meat locally if that’s an issue that you face. All you do is choose the size and type of box that you want and the meat gets shipped frozen to your front door on the same day every month (or every other month). It really does! And I live in Dallas, TX so that’s saying something. The boxes are packed with dry ice and I’ve never gotten spoiled meat from butcher box. 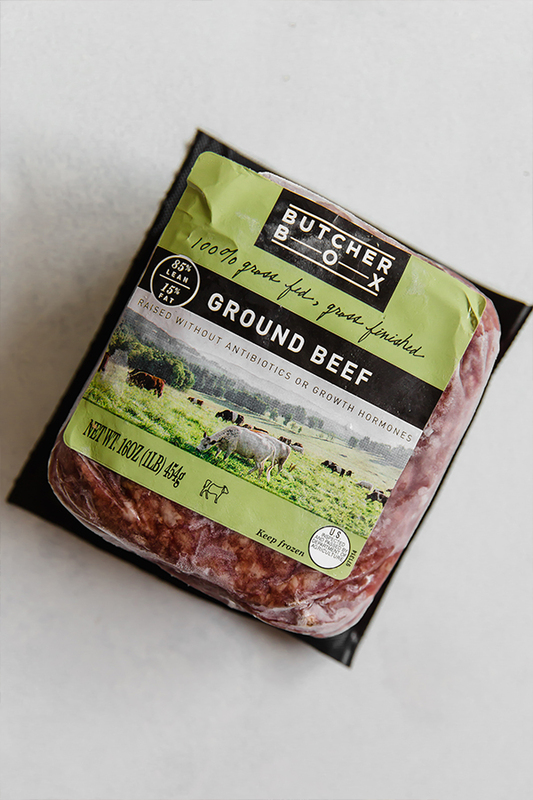 The beef from ButcherBox is grass-fed and grass-finished, and you can for sure taste the difference! Cattle are raised on pasture with the freedom to roam and get plenty of vitamins and minerals from the sun and grass! They use heritage breeds that are able to forage on pasture. These chickens have outdoor access to where they’re able to forage. Are the Plans Flexible and Cost Effective? Yes! This is what drew me to Butcher Box. Custom box (this is more expensive, but you’re able to choose your exact cuts. The boxes are priced per serving (except for the custom) and the prices are competitive and very fair for the quality of convenience of ButcherBox. Can you customize how often you receive a box? Yes! You can order boxes either every 30 days or 60 days. The 60-day option is great if you want to stock up and save costs, or if you just don’t eat a ton of meat. I started ordering ButcherBox around Spring/Summer just to see what the hype was about, and it really pleasantly surprised me! I love buying local meat, but I can’t always make it out to the farmers market, and I wanted to be able to offset costs a bit. I loved having the meat easily delivered to my door and stashed in my fridge ready to go. No fighting crowds at the Farmer’s Market every single weekend, and no overpaying for meat from the grocery store when I’m not really sure of the quality. You can taste the quality. Their pork sausage was nightshade free. Helloooo. I wasn’t expecting this but when I got their pork breakfast sausage, it didn’t have any nightshades! This is a super rare find and one that I very much appreciated at the time. Do I have any special discounts? I do! If you use this link, you’ll get $15 off, free shipping, and free bacon in your first box! Who doesn’t like free bacon? So, who is ButcherBox Good For? Anyone who doesn’t have a good local source of high-quality meat. Those who are looking to offset grocery costs. Anyone is looking to make grocery shopping easier. Who is it maybe not best for? People who don’t eat a lot of meat. Those who have a local source that they don’t want to switch away from. And that’s my two-cents about butcher box! Have you tried Butcher Box? What are your thoughts?